Vegas, Elementary, Made in Jersey: Procedurals on CBS reviewed. Three new series demonstrate how difficult it can be to crack the seemingly simple procedural formula. Procedurals are the worker bees of television. The tireless toil of cops, doctors, lawyers, forensic scientists, and federal agents produces sweet ratings honey—seven of the 10 top-rated scripted shows in the 2011-12 season were procedurals—but no one pays them much mind. Every year, one drone rises above the rest to receive critical acclaim—currently The Good Wife is the critics’ pet—but otherwise, they’re so plentiful and popular that their essential genius goes unappreciated. CBS rules this niche—six of those seven hits air on the network—and this week it is introducing three new ones: Vegas, Elementary, and Made in Jersey. Their settings are rural, urban, and suburban; and their heroes are a modest Westerner, an arrogant foreigner, and a gregarious East Coaster; but all are attempts to find a formula that can be entertainingly repeated 24 times a year. Two of them are successful. One can’t crack the case. In Elementary (Thursdays at 10 p.m.), Jonny Lee Miller’s Sherlock Holmes is a recovering drug addict whose post-rehab regime has him working as a consulting detective in present-day New York. 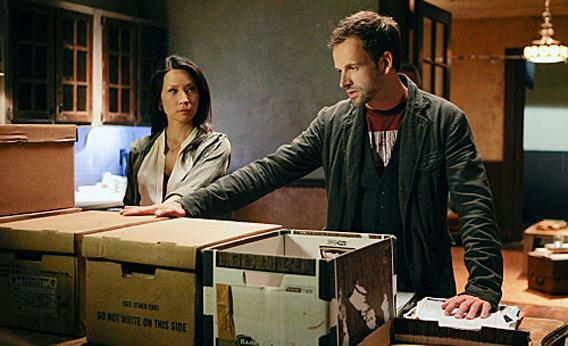 His stylish partner in crimesolving is Dr. Joan Watson (Lucy Liu), a former surgeon who now spends her days as a “sober companion,” a line of work that Holmes charmingly likens to “a glorified helper monkey.” None of these departures from the Conan Doyle canon bothers me in the slightest. A female Watson feels fresh and full of potential; Holmes’ powers of deduction should work just as well on this side of the Atlantic; and Benedict Cumberbatch has no monopoly on 21st-century Holmesiness. But that British version raises a red flag: The BBC has produced six episodes of Sherlock since 2010. Two, “A Study in Pink” and “A Scandal in Belgravia,” were superb. One, “The Blind Banker,” was embarrassingly bad. And the other three, like the curate’s egg, were good in parts. If Britain’s finest TV writers can barely manage to stay above the Mendoza line, is there any hope that CBS scribes churning out two dozen episodes a year can consistently create Holmes-worthy logic puzzles? Judging from the pilot, the answer is no. Miller and Liu are both captivating actors, and their damaged characters mesh together well, but the mystery—the show’s raison d’être—is a disaster. Worst of all, it breaks the cardinal rule of the detective story, spelled out by P.D. James in her book Talking About Detective Fiction: The solution must be “one which we the readers should be able to arrive at from evidence fairly presented.” Instead, Elementary’s first investigation depends on guesswork, coincidence, plot points that have been used so frequently they are now procedural clichés, and the utterly unbelievable. The first three of those sins are annoying, but the last is unforgivable. TV crime always requires a certain suspension of disbelief—suspects confess far too easily, DNA results appear in a flash—so I don’t care that Watson always finds street parking in Manhattan or that Holmes happens to find a decade-old case just like the one he’s currently investigating by flipping through files. But would an NYPD detective give a drug addict fresh out of “junkie jail” unfettered access to his crime scene and interrogation room? By the mystery’s big reveal, a farce of technology that will make anyone who’s recently bought a cellphone scoff, I was near screaming with irritation. There is nothing original about Made in Jersey (Fridays at 9 p.m.). Its setup—working-class Jersey girl shakes up snooty Manhattan law firm—is 20 percent My Cousin Vinny, 80 percent Legally Blonde. Let’s call it Legally Bayonned. But in the world of procedurals, a sturdy frame matters more than an original concept. Elementary is an architectural folly that can’t possibly stand up to the wear and tear of a season’s worth of cases; Made in Jersey on the other hand, is an unglamorous but solid split-level suburban that will have no problem passing inspection. In the opening episode, we meet ballsy new associate Martina Garretti (Janet Montgomery), the stuck-up lawyers and salt-of-the-earth paralegals she works with, and her chaotic-but-loving family over in the Garden State. Sherlock has his smartphone, but Martina’s army of human clue-droppers and intel sources are far more telegenic. Subtlety isn’t among Made in Jersey’s attributes. The pilot’s first images are a suspension bridge and a subway tunnel, and in her red blazer and amazingly voluminous hair, Martina stands out from her sober-suited, sleek-coiffed colleagues at Stark & Rowan. She has much more in common with her clients than her co-workers, and that’s her biggest asset: She’s the plebe whisperer, able to explain the mysterious world of tight jeans and cheap hair dye to the children of privilege preparing the case for the defense. 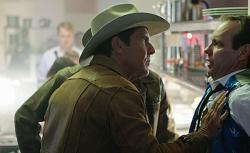 The charming Vegas (Tuesdays at 10 p.m.) follows Ralph Lamb (Dennis Quaid, looking mid-century manly), a taciturn rancher, as he reluctantly tackles the task of cleaning up the crime that the new casinos are bringing to 1960 Las Vegas. He’s the charismatic, enigmatic force that every procedural needs at its center, but he’s got family and friends to help with his investigations, and in Michael Chiklis’ casino owner Vincent Savino, an enemy worth his time and trouble. Vegas relies on viewers recognizing clues from the future—not just the physical evidence, like that sign proclaiming “Nuclear Test Site,” but also in the social mores of an era when parents had more control over their kids’ lives and men over their womenfolk. For all their apparent dissimilarities, testosterone-tinged Vegas and estrogen-infused Made in Jersey are both classic, well-made legal procedurals centered around family. The heroes—a fourth-generation rancher and the last in a long line of beauticians—are slowly moving away from the trades that have been in their blood for generations. And both wear a star: Ralph clips a metal one to his vest, while Martina gets one tattooed on her hip. Thanks to nice touches like that star, no matter how dogged, diligent, and creative Martina is, her co-workers will never see her as anything other than a cut-rate upstart with trashy relatives. “Don’t worry,” one WASPy colleague tells her, “You lower expectations just by walking in the room.” In that sense, Martina is just like a procedural. Underestimated and unappreciated, she works hard and makes it look easy. And it doesn’t matter what the snobs think, because real people will love her.